Switzerland competed at the 2016 Summer Olympics in Rio de Janeiro, Brazil, from 5 to 21 August 2016. Swiss athletes have appeared in every edition of the Summer Olympic Games in the modern era, except for a partial boycott of the 1956 Summer Olympics in Melbourne as a protest to the Soviet invasion of Hungary. The Swiss team consisted of 104 athletes, 59 men and 45 women, across seventeen sports. Switzerland returned home from Rio de Janeiro with seven medals (three golds, two silver, and two bronze), which matched its overall tally from the 1996 Summer Olympics in Atlanta and the 2008 Summer Olympics in Beijing. Two of these medals were awarded to the Swiss team in cycling, with one each in artistic gymnastics, rowing, shooting, tennis, and triathlon. Among the nation's winners were professional road cyclist Fabian Cancellara, who saved the best race of his storied career for last by reclaiming his men's time trial title for the second time (the first did so in Beijing 2008, and mountain biker Nino Schurter, who completed a full set of medals in his career hardware by striking the gold at his third attempt in the men's cross country race. Entering the Games as the reigning world and double European champions, the lightweight four crew of Mario Gyr, Simon Niepmann, Simon Schürch, and Lucas Tramèr propelled their way ahead of their Danish and French rivals to take the country's first ever Olympic title in rowing after two decades. On the women's side, pistol shooter Heidi Diethelm Gerber, all-around gymnast Giulia Steingruber, and former world-number-one tennis player Martina Hingis, along with her doubles partner Timea Bacsinszky, accomplished their historic feats as the first ever Swiss females to stand on the podium in their respective sporting disciplines. Meanwhile, Nicola Spirig Hug picked up a silver in the women's triathlon to become the first in Olympic history to collect more than a single medal, bowing out her title defense to the world-ranked American challenger Gwen Jorgensen. The Swiss Olympic Association selected a roster of 104 athletes, 59 men and 45 women, to compete across seventeen different sports at these Games; it was the nation's largest delegation ever sent to the Summer Olympics since 1984, without any association to the traditional team-based sports. Moreover, the Swiss team featured the largest share of women in its Summer Olympic history, constituting about 43 percent of the total. Roughly three quarters of the nation's roster made their Olympic debut in Rio de Janeiro, with the remainder having attended at least a single edition. These Games also witnessed the Swiss male gymnasts compete for the first time in the team all-around tournament since 1992. Athletics and cycling accounted for the largest number of competitors on the Swiss roster, with 16 entries each, respectively. Three of the nation's medalists from London 2012 returned, with equestrian show jumper Steve Guerdat and triathlete Nicola Spirig Hug looking to defend their titles in Rio de Janeiro, and with mountain biker Nino Schurter hoping to complete his collection of Olympic medals for gold at his third attempt. Professional road cyclist and 2008 time trial champion Fabian Cancellara joined an exclusive club of Swiss athletes, along with Guerdat, Spirig Hug, and 2004 bronze medalist Sven Riederer (men's triathlon), who earned four consecutive trips to the Games, aiming to close out his stellar sporting career with another golden finish in the same event. Other notable athletes on the Swiss team included the rowing quartet of Mario Gyr, Simon Niepmann, Simon Schürch, and Lucas Tramèr, who entered the Games as the defending world and two-time European champions in the men's lightweight four; former single-handed sailor Nathalie Brugger and her Argentine-born partner Matías Bühler in the inaugural Nacra 17 catamaran; pole vaulter Nicole Büchler; European Games champion Heidi Diethelm Gerber in the women's pistol shooting; and former world-number-one tennis player Martina Hingis, who returned to the Olympic scene from her 20-year absence to compete alongside her partner Timea Bacsinszky in the women's doubles. Artistic gymnast and 2015 European all-around champion Giulia Steingruber was selected by the association to carry the Swiss flag in the opening ceremony, the first by a female since 1988 and third overall in Summer Olympic history. New York-based golfer Albane Valenzuela (aged 18) was Switzerland's youngest competitor of the Games, with lone dressage rider Marcela Krinke-Susmelj rounding out the lineup as the oldest member (aged 50). On May 5, 2016, the Swiss Olympic Association had selected three marathon runners (Abraham, Kreienbühl, and Neuenschwander), who achieved the federation's entry standards, for the Olympics. Fourteen more athletes (one man and thirteen women) rounded out the Swiss track and field team for the Games at the end of the qualifying period on July 11, 2016. Switzerland has qualified one badminton player for the women's singles into the Olympic tournament. London 2012 Olympian Sabrina Jaquet picked up one of the spare athlete berths from the doubles as the next highest-ranked eligible player in the BWF World Rankings as of 5 May 2016. Switzerland has qualified a pair of canoeists in the men's C-2 class by obtaining a top finish and an outright Olympic berth at the 2016 European Canoe Slalom Championships in Liptovský Mikuláš, Slovakia. The slalom canoeists were named to the Swiss team on May 26, 2016. Switzerland has received a spare berth from the International Canoe Federation to send one canoeist competing in the men's K-1 1000 m, as a response to the "multiple positive" cases on doping that provoked a one-year suspension for Belarus and Romania. Swiss riders qualified for the following quota places in the men's and women's Olympic road race by virtue of their top 15 final national ranking in the 2015 UCI World Tour (for men) and top 22 in the UCI World Ranking (for women). The road cycling team, led by two-time Olympic medalist Fabian Cancellara, was officially named to the Swiss cycling roster for the Games on July 1, 2016. Following the completion of the 2016 UCI Track Cycling World Championships, Swiss riders have accumulated spots in the men's team pursuit, as well as the men's omnium. The Swiss Olympic Association announced the track cycling squad for the Olympics on March 15, 2016. Swiss mountain bikers qualified for three men's and two women's quota places into the Olympic cross-country race, as a result of the nation's top finish for both men and women in the UCI Olympic Ranking List of May 25, 2016. The mountain biking team, highlighted by double Olympic medalist Nino Schurter, was named to the Swiss roster on June 6, 2016. Swiss riders qualified for one men's quota place in BMX at the Olympics, as a result of the nation's ninth-place finish in the UCI Olympic Ranking List of May 31, 2016. BMX rider David Graf was selected to the Swiss team for the Olympics on June 10, 2016. Switzerland has qualified a full squad in the team jumping competition after having achieved one of the three Olympic quota places available from the 2015 European Championships. Three more Swiss riders have formed a composite squad to compete in the Olympic team eventing by virtue of the following results in the individual FEI Olympic rankings: a top two finish from European combined ranking, and two top nine finishes from the combined overall FEI Olympic rankings. Marcela Krinke-Susmelj and her Danish Warmblood Molberg were named to the Swiss roster on June 10, 2016. Swiss fencers have qualified a full squad each in the men's team épée by virtue of their top 4 national finish in the FIE Olympic Team Rankings. Meanwhile, London 2012 Olympian Tiffany Géroudet had claimed the sole Olympic spot as the winner of the women's épée at the European Zonal Qualifier in Prague, Czech Republic. The fencing team was named to the Olympic roster on May 31, 2016. Switzerland has entered two golfers into the Olympic tournament. Fabienne In-Albon (world no. 408) and Albane Valenzuela (world no. 378) qualified directly among the top 60 eligible players for the women's event based on the IGF World Rankings as of 11 July 2016. Switzerland has fielded a full squad of five artistic gymnasts (five men and one woman) into the Olympic competition. The men's team qualified through a top eight finish at the 2015 World Artistic Gymnastics Championships in Glasgow, making its first trip to the Games since 1992. Meanwhile, an additional Olympic berth had been awarded to the Swiss female gymnast, who participated in the apparatus and all-around events at the Olympic Test Event in Rio de Janeiro. The artistic gymnastics squad was named to the Swiss roster for the Games on July 8, 2016. Switzerland has qualified three judokas for the following weight classes at the Games. Ciril Grossklaus, Evelyne Schopp, and London 2012 Olympian Ludovic Chammartin were ranked among the top 22 eligible judokas for men and top 14 for women in the IJF World Ranking List of May 30, 2016. Switzerland has qualified a total of four boats for each of the following rowing classes into the Olympic regatta. Rowers competing in men's lightweight double sculls, men's lightweight four, men's quadruple sculls, and women's single sculls had confirmed Olympic places for their boats at the 2015 FISA World Championships in Lac d'Aiguebelette, France. The Swiss Olympic Association announced the first batch of rowers competing in the men's lightweight four and women's single sculls on April 22, 2016. The men's lightweight double sculls rowers (Schmid & Wiederkehr) were named to the Swiss team on May 13, 2016, while the men's quadruple sculls crew rounded out the team selection on June 24, 2016. Swiss sailors have qualified one boat in each of the following classes through the 2014 ISAF Sailing World Championships, the individual fleet Worlds, and European qualifying regattas. They also picked up a spare Olympic berth freed by Africa as the next highest-ranked eligible crew in the women's 470 based on the results at the 2015 World Championships. The entire sailing squad was named to the Swiss team on May 9, 2016, with Nathalie Brugger (Nacra 17) and the men's 470 crew Yannick Brauchli and Romuald Hausser remarkably going to their third Olympics. 49er crew members Lucien Cujean and Sébastien Schneiter were added to Switzerland's sailing lineup for the Games on June 24, 2016, after the nation received a spare Olympic berth freed up by Canada from the International Sailing Federation. Swiss shooters have achieved quota places for the following events by virtue of their best finishes at the 2015 ISSF World Cup series, and European Championships or Games, as long as they obtained a minimum qualifying score (MQS) by March 31, 2016. The Swiss Olympic Association announced the shooting team, highlighted by London 2012 Olympian and European Games pistol champion Heidi Diethelm Gerber, on June 2, 2016. With a double starter (owned by Nina Christen) securing quota places in two women's rifle events, the Swiss team decided to exchange one of them with the men's 50 m rifle three positions instead based on performances throughout the qualifying period. The slot was awarded to 2010 Youth Olympian Jan Lochbichler. Jérémy Desplanches, Sasha Touretski, and London 2012 Olympian Yannick Käser were selected to the Swiss swimming team with a FINA Olympic A-cut on March 31, 2016. Käser's fellow Olympian Martina van Berkel, individual medley swimmer Maria Ugolkova, and Alexandre Haldemann, who was invited by FINA to compete in the men's 200 m freestyle as the fastest entrant outside of Olympic qualifying time, joined the roster on July 11, 2016. Butterfly stalwart Danielle Villars and relay swimmer Noémi Girardet rounded out the swimming lineup on July 15. Switzerland has fielded a squad of two synchronized swimmers to compete only in the women's duet by virtue of their eighth-place finish at the FINA Olympic test event in Rio de Janeiro. Switzerland has entered two women tennis players into the Olympic tournament. Double Olympic medalist and four-time Olympian Roger Federer (world no. 2) and his doubles partner Stan Wawrinka (world no. 5) qualified directly for the men's singles as two of the top 56 eligible players in the ATP World Rankings, while Timea Bacsinszky (world no. 10) and Belinda Bencic (world no. 8) did so for the women's singles based on their WTA World Rankings as of 6 June 2016. Having been directly entered to the singles, Bacsinszky also opted to compete in the women's doubles, along with her rookie partner Viktorija Golubic (as the latter would be on her first Olympic appearance), while Bencic paired up with returning Olympian Martina Hingis from her 20-year absence in the same tournament by virtue of the latter's top-10 WTA ranking. On July 26, 2016, Federer withdrew from the Games due to his knee injury problems sustained from the Madrid Open, leaving Wawrinka as the lone male player. The following day, Bencic joined him as one of the tennis players to be pulled out from the Games, citing a wrist injury sustained from the Wimbledon Championships. Therefore, Bacsinszky replaced Bencic in the women's doubles with Hingis, and her partnering with Golubic was undone. Wawrinka was the last player to withdraw from the Games due to a back injury, leaving Switzerland with only females in the tennis team for the first time. Switzerland has qualified a total of four triathletes for the following events at the Olympics. London 2012 champion Nicola Spirig had her sights set to an Olympic title defense in the women's triathlon with a gold medal triumph at the 2015 European Games. Meanwhile, three-time Olympian Sven Riederer, Andrea Salvisberg, and Jolanda Annen were ranked among the top 40 eligible triathletes each in the men's and women's event, respectively, based on the ITU Olympic Qualification List as of May 15, 2016. Two Swiss women's beach volleyball teams qualified directly for the Olympics by virtue of their nation's top 15 placement in the FIVB Olympic Rankings as of June 13, 2016. These places were awarded to rookies Isabelle Forrer and Anouk Vergé-Dépré, as well as London 2012 Olympian Nadine Zumkehr and her rookie partner Joana Heidrich. ^ a b "Giulia Steingruber ist Schweizer Fahnenträgerin" [Giulia Steingruber is the Swiss flag bearer] (in German). Swiss Gymnastics Federation. Archived from the original on 4 August 2016. Retrieved 4 August 2016. ^ a b c "Switzerland to send 105 athletes to Rio". www.swissinfo.ch. Swissinfo. 2 August 2016. Retrieved 26 August 2018. ^ "In pictures: final day success takes Swiss to seven medals". www.thelocal.ch. The Local. 22 August 2016. Retrieved 26 August 2018. ^ "Olympic Games: Cancellara caps off 16-year career with gold". Cyclingnews.com. 10 August 2016. Retrieved 26 August 2018. ^ "Nino Schurter finally takes Olympic Gold". Union Cycliste Internationale. 21 August 2016. Retrieved 26 August 2018. ^ "Swiss rowers win gold in Rio". Swissinfo. 11 August 2016. Retrieved 26 August 2018. ^ "Swiss win tennis silver and gymnastics bronze in Rio". Swissinfo. 15 August 2016. Retrieved 26 August 2018. ^ "Swiss triathlete gets Olympic silver". Swissinfo. 20 August 2016. Retrieved 26 August 2018. ^ a b c Graves, Will (26 October 2015). "U.S. Men Off to Solid Start in World Gymnastics Qualifying". Universal Sports Network. Archived from the original on 27 October 2015. Retrieved 27 October 2015. ^ "Hingis relishing Olympic Games after 20-year absence". Daily FT. 6 August 2016. Retrieved 27 August 2018. ^ Turner, Amanda (5 August 2016). "Five Female Gymnasts Flag Bearers at Opening Ceremonies". International Gymnast Magazine. Retrieved 27 August 2018. ^ "Neuenschwander, Abraham und Kreienbühl vertreten die Schweiz im Olympia-Marathon in Rio 2016" [Neuenschwander, Abraham und Kreienbühl will represent Switzerland at the Olympic marathon in Rio 2016] (in German). Swiss Olympic Association. 5 May 2016. Retrieved 6 May 2016. ^ "Grösste Schweizer Delegation seit zwanzig Jahren an den Olympischen Sommerspielen 2016 in Rio" [Neuenschwander, Abraham und Kreienbühl will represent Switzerland at the Olympic marathon in Rio 2016] (in German). Swiss Olympic Association. 18 July 2016. Retrieved 19 July 2016. ^ "Trio Get Rio 2016 Tripartite Places". Badminton World Federation. 25 May 2016. Archived from the original on 29 May 2016. Retrieved 26 May 2016. ^ "New champions at Euros". International Canoe Federation. 16 May 2016. Retrieved 16 May 2016. ^ a b "Drei weitere Triathleten und zwei Kanuten für Rio 2016 selektioniert" [Three other triathletes and two canoeists were selected for Rio 2016] (in German). Swiss Olympic Association. 26 May 2016. Retrieved 26 May 2016. ^ "109 Athleten für Olympia selektioniert" [109 athletes selected for Olympics] (in German). Neue Zürcher Zeitung. 18 July 2016. Retrieved 19 July 2016. ^ "Cancellara, Albasini, Morabito und Reichenbach fahren das Rad-Strassenrennen in Rio – die Brüder Ben und Felix Vogg vertreten die Schweiz im Eventing" [Cancellara, Albasini, Morabito and Reichenbach rides the road cycling race in Rio; brothers Ben and Felix Vogg will represent Switzerland in eventing] (in German). Swiss Olympic Association. 1 July 2016. Retrieved 3 July 2016. ^ "Swiss Olympic selektioniert sechs Bahnradfahrer für Rio 2016" [Swiss Olympic Committee selected six track cyclists for Rio 2016] (in German). Swiss Olympic Association. 15 March 2016. Retrieved 20 April 2016. ^ "Jolanda Neff und Nino Schurter führen das Schweizer Mountainbike-Team an den Olympischen Spielen in Rio an" [Jolanda Neff and Nino Schurter leads the Swiss mountain biking team at the Rio Olympics] (in German). Swiss Olympic Association. 6 June 2016. Retrieved 7 June 2016. ^ "Die Dressurreiterin Marcela Krinke Susmelj und der BMX-Fahrer David Graf stehen im Swiss Olympic Team für Rio 2016" [Dressage rider Marcela Krinke Susmelj and BMX rider David Graf were named to the Swiss Olympic team for Rio 2016] (in German). Swiss Olympic Association. 10 June 2016. Retrieved 10 June 2016. ^ "Great Britain showjumping team qualify for Rio Olympics". BBC Sport. 21 August 2015. Retrieved 22 August 2015. ^ "Marcela Krinke-Susmelj Officially Nominated as Swiss Individual for 2016 Olympic Games". eurodressage. 12 June 2016. Retrieved 12 June 2016. ^ Etchells, Daniel (14 February 2016). "Romania claim team gold at women's épée World Cup in Buenos Aires as Rio 2016 qualifiers are decided". Inside the Games. Retrieved 16 February 2016. ^ "Fünf Degenfechter fahren nach Rio" [Five fencers will go to Rio] (in German). Swiss Olympic Association. 31 May 2016. Retrieved 31 May 2016. ^ "Japan, Kohei Uchimura lead as first Men's teams qualify for Rio at Glasgow Worlds". FIG. 26 October 2015. Retrieved 28 October 2015. ^ "Steingruber vertritt die Schweiz in Rio im Kunstturn-Einzelwettbewerb - Baumann, Brägger, Gischard, Hegi, und Yusof sind für den Teamwettkampf selektioniert" [Steingruber will represent Switzerland in the artistic gymnastics competition at Rio; Baumann, Brägger, Gischard, Hegi, and Yusof are selected for the team competition] (in German). Swiss Olympic Association. 8 July 2016. Retrieved 9 July 2016. ^ "Judoka Evelyne Tschopp qualifiziert für die Olympischen Spiele in Rio" [Judoka Evelyne Tschopp qualified for the Rio Olympics] (in German). Basellandschaftliche Zeitung. 5 June 2016. Retrieved 6 June 2016. ^ "Eine Ruderin und vier Ruderer für Rio 2016 selektioniert" [A coxless four and a rower had been selected for Rio 2016] (in German). Swiss Olympic Association. 22 April 2016. Retrieved 20 April 2016. ^ "Zwei weitere Ruderer für Rio 2016 selektioniert" [Two more rowers selected for Rio 2016] (in German). Swiss Olympic Association. 13 May 2016. Retrieved 15 May 2016. ^ "Rio 2016 Olympic Places Awarded In Men's And Women's 470 At Santander 2014 ISAF Worlds". ISAF. Archived from the original on 11 February 2015. Retrieved 19 September 2014. ^ "Final country places secured for Rio 2016". ISAF. 4 April 2016. Retrieved 4 April 2016. ^ "Swiss Olympic selektioniert die Schweizer Segel-Equipe für Rio 2016" [Swiss Olympic Committee selected the sailing team for Rio 2016] (in German). Swiss Olympic Association. 9 May 2016. Retrieved 10 May 2016. ^ "Der Ruder-Doppelvierer und das 49er-Segelteam der Männer sind in Rio am Start" [Quadruple sculls rowers and 49er sailing team are going to Rio] (in German). Swiss Olympic Association. 24 June 2016. Retrieved 25 June 2016. ^ "Vier Schützen für das Swiss Olympic Team Rio 2016 selektioniert" [Four shooters were selected to the Olympic team for Rio 2016] (in German). Swiss Olympic Association. 2 June 2016. Retrieved 3 June 2016. ^ a b "Schwimmen und Synchronschwimmen selektioniert für Rio 2016" [Swimmers and synchronized swimmers had been selected for Rio 2016] (in German). Swiss Olympic Association. 31 March 2016. Retrieved 20 April 2016. ^ "Die Schwimmerinnen Ugolkova und van Berkel sowie der Schwimmer Haldemann sind für Rio 2016 selektioniert" [Swimmers Ugolkova, van Berkel, and Haldemann selected for Rio 2016] (in German). Swiss Olympic Association. 11 July 2016. Retrieved 12 July 2016. ^ "Girardet und Villars komplettieren das Schweizer Schwimmteam an den Olympischen Spielen in Rio de Janeiro – Golubic ersetzt Knoll im Tennis-Frauen-Doppel" [Girardet and Villars completes the Swiss swimming team at the Rio Olympics; Golubic replaced Kroll in the women's tennis doubles] (in German). Swiss Olympic Association. 15 July 2016. Retrieved 16 July 2016. ^ a b "ITF announces updated entries for Rio 2016 Olympics". International Tennis Federation. 19 July 2016. Retrieved 29 July 2016. ^ "Sechs Schweizer Tennisspieler für Rio 2016 selektioniert – Roger Federer vor seiner fünften Olympiateilnahme" [Six Swiss tennis players were selected for Rio 2016; Roger Federer was slated to participate at his fifth Olympics] (in German). Swiss Olympic Association. 16 June 2016. Retrieved 16 June 2016. ^ "Roger Federer to miss Rio 2016 Olympics and rest of season with knee injury". BBC Sport. 26 July 2016. Retrieved 27 July 2016. ^ "Rio 2016: Belinda Bencic out of Olympics to focus on US Open". BBC Sport. 27 July 2016. Retrieved 27 July 2016. ^ "Rio 2016: Stan Wawrinka out of Olympic Games due to injury". BBC Sport. 2 August 2016. Retrieved 2 August 2016. ^ "Britain and Switzerland qualify for the Rio 2016 Olympic triathlon". Rio 2016. Archived from the original on 1 August 2015. Retrieved 16 June 2015. ^ "Zwei Schweizer Frauenteams bestreiten das Beachvolleyballturnier an den Olympischen Spielen in Rio de Janeiro" [Two Swiss women's teams compete in the beach volleyball tournament at the Olympic Games in Rio de Janeiro] (in German). Swiss Olympic Association. 21 June 2016. Retrieved 22 June 2016. 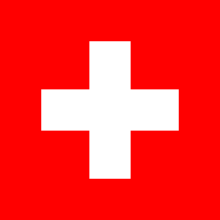 Wikimedia Commons has media related to Switzerland at the 2016 Summer Olympics. Switzerland hosted the 1928 and 1948 Winter Olympics.